Okay -- when I said I'd post artwork "tomorrow" I really meant "the day AFTER tomorrow"! Anyway, that's my story and I'm stickin' to it! I've just finished making projects for a consultant swap I'm in. I had the Footloose paper pack. I know there might be snow on the ground where you are, but can you handle some summertime artwork right about now? My first project is a Cricut card featuring the A Tree stamp set. I'm just starting to play with the Cricut card shapes - there are 100 to choose from!!! In addition to the card shape, I used the coordinating basic shape on the card for the B&T paper and the piece the tree trunk is stamped on. I also use the banner shape to stamp the sentiment on. And even though this stamp set has a butterfly, I used a Cricut butterfly with our new bitty pearls for the body. There is a lot of 3-D on this card! I LOVE 3-D, but it might be hard to mail. Perfect for hand-delivery or a padded envelope. I curled the banner over a blending pen in the center and curled it the other way on the end. 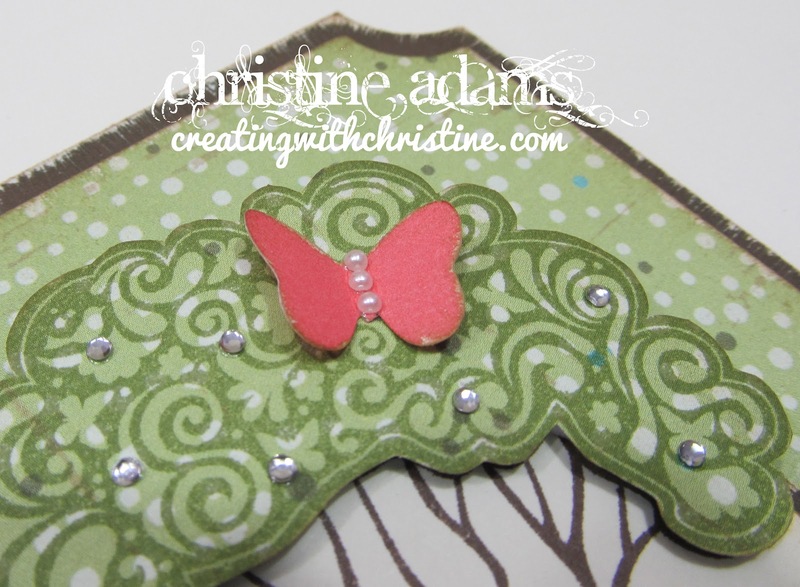 I accented the banner and tree with bitty sparkles. PS -- I forgot to mention -- this card was totally scraplifted from our new Idea Book! I just loved the card they featured and had to try my hand at it!